Austin Petrie pulls in his line after a tip up is tripped while Rob Andersen waits to assist in landing the fish. After the catch, Austin poses with his Pike. Kids holding their Pike: From left to right... Payton Chesser, Joey Mockovac, Seth Wickens-Walther, Brandon Radtke, Austin Petrie, Noah Larson, Jordan Burke, Jack Petrie, and Tim Schlick. Sixteen Boy Scouts and four adult leaders from Boy Scout Troop 33 in DeKalb, Illinois made a much-anticipated return trip to Phelps Wisconsin on Saturday, January 16th. 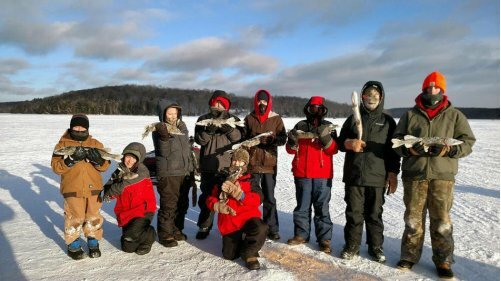 This is the 2nd year the Troop has visited Lac Vieux Desert for an ice fishing adventure. 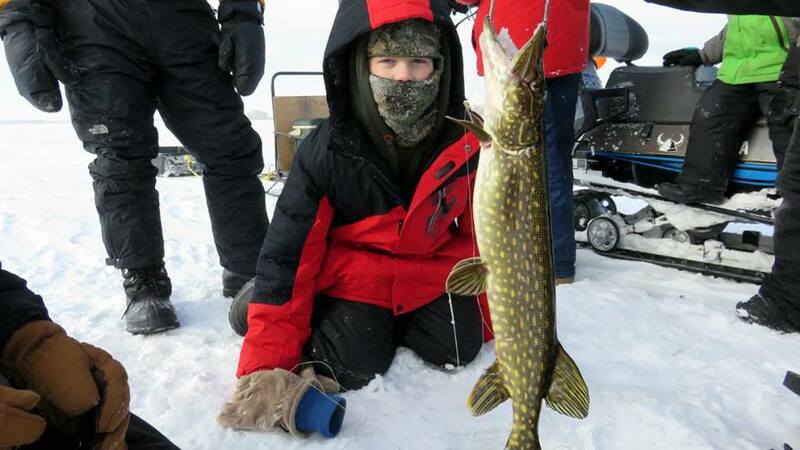 Chad McNett, one of Troop 33's leaders, first approached Robbie Andersen of Hillside Resort in 2014 about the ice fishing idea for the Boy Scouts. Andersen jumped at the idea and January of 2015 was the first year for the trip. "The trip was so successful and the kids had so much fun, they couldn't wait to go back in 2016" said McNett. This year's trip was almost cancelled due to extreme weather, but despite a bitterly cold forecast, the boys were determined to make the trek and catch some fish. After a few phone calls with Andersen to double check on the feasibility of the trip, it was decided to go ahead with it. "I knew the kids were looking forward to this trip. We didn't want to cancel it if there was a safe way to make it happen. So we came up with a plan and decided to give it a shot" said Andersen. The Troop arrived at Thunder Bay Resort late that Saturday afternoon. Jim and Rochelle Argoudelis, owners of Thunder Bay, provided accommodations for the weekend. The cabins at Thunder Bay Resort are perched on a hill that overlooks the southeast part of Lac Vieux Desert. Jim and Rochelle served the scouts an Italian dinner from TJ Grizzly's that included five pizzas and a giant pan of lasagna. They also served salads, soups, and delicious draft root beer from Thunder Bay's lodge. It was all eaten quickly by the hungry scouts who had traveled most the day. For the fishing day, Andersen and several of his friends including Colin Crawford, Barb Gajewski, Bill Artwich, Mike Gill, and Mark Curtis stepped up for the 2nd year in a row and volunteered to lead the boys onto the ice for a day of fishing. Sunday the 17th, the scouts met Andersen lakeside. He and the volunteer crew had been up early setting up numerous tip-ups and preparing for the day. A couple days prior, they had placed Rob's heated ice shack on the lake and built a 28-foot wide wall to block the north winds. A firepit would keep the scouts warm as the fish were biting throughout the day. "This setup was the perfect "home base" on the ice" said McNett. A handful of the boys were new to the trip this year so Rob gave them a lesson in how tip-ups work to start their day. He also told them about the types of fish they might catch. It wasn't long before the flags started to pop up and the boys were pulling up Northern Pike. They caught at least 30 pike throughout the day. Rob and the other volunteers made sure the boys stayed safe & warm, and that they had plenty of chances throughout the day to catch fish as well. Due to the very cold temps and north winds, plenty of time was spent by the fire and inside the ice shack warming cold hands and feet. But the cold didn't stop the fun. The scouts enjoyed steaming hot dogs, chips, and cookies for lunch. "The weather was a bit chilly. Our day of fishing started at negative 10 degrees and we enjoyed a high temp of negative 2 degrees. Factor in 15+ mph winds out of the north and you can really appreciate the importance of the Scout motto, "Be Prepared". Lots of activity, decent fishing, and good company made it a great day of ice fishing with a total of 9 Northern Pike and 1 Walleye in our keeper pile" said McNett. Rick and Jeanne Brown of Phelps, who visited with the boys the night before they fished, donated a brand new tip-up to be given to the scout who caught the largest fish of the day. That honor went to Seth Wickens-Walther. Later Sunday night, the group enjoyed a fish fry of the day's catch. Fresh fish, sloppy Joe's, and cheesy potatoes were the stars of the menu. The scouts of Troop 33 in DeKalb want to thank all those who volunteered in making this 2nd year's ice fishing trip such a success. "The time they spent with us was incredible, especially when you consider the bitter cold temperatures that we experienced that day. Without Rob, Jim & Rochelle, and all the other people willing to volunteer their time and talents, this ice fishing adventure simply could not have happened. It was another amazing winter time trip to Lac Vieux Desert that these boys will always remember" stated McNett.